A new online resource, coauthored by an ARS scientist, will make it easier to identify and study parasitic wasps, such as this Angustocorpa wasp from South Africa (about 2.5 millimeters long). (Matt Buffington, D3468-1). 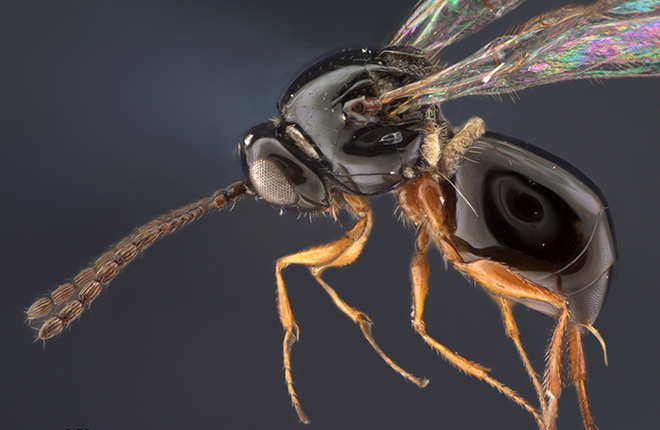 This Didyctium wasp is found worldwide (about 2.5 millimeters long). (Matt Buffington, D3469-1). A light microscope image of a wasp species of Leptopilina (about 2.5 millimeters long). Species in North America are being evaluated for biological control of spotted wing Drosophila flies. (Matt Buffington, D3470-1). A light microscope image of a wasp species of Afrostilba (about 2.5 millimeters long). Members of this group are parasitoids of leaf-mining flies (Agromyzidae). (Matt Buffington, D3471-1). 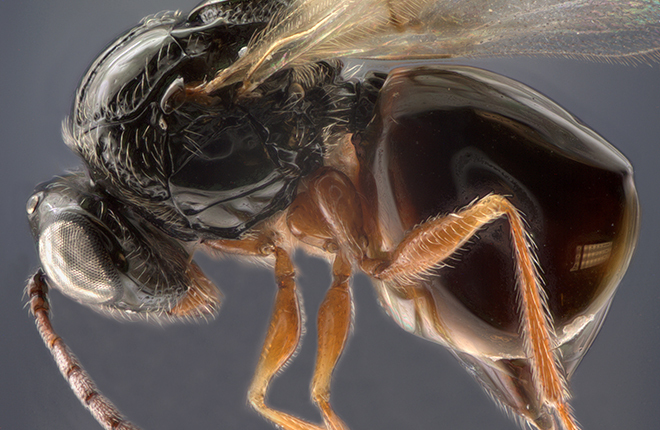 Determining the identity of parasitic wasps—some measuring less than a millimeter long—can be a time-consuming process that includes comparing their features to descriptions in published works and disparate specimen collections. And correct identification is critical, as these parasitic wasps lay their eggs inside other insect species, killing the host insect in the process. As a result, these wasps are used extensively, worldwide, to control pest insect populations in agriculture. Now, making such identifications could begin with the click of a mouse. An international team of researchers, including a scientist from the Agricultural Research Service, has published a new, online document called a “monograph” that will make it easier to identify and study wasps belonging to a group called the “Cynipoidea.” While these wasps are common worldwide, the monograph focuses on species from the Afrotropical Region. This vast area, encompassing all of Africa south of the Sahara Desert, as well as the southern Arabian Peninsula, Madagascar, and surrounding islands, is ripe for entomological discovery. The monograph uses pairs of interactive, image-based identification keys—including those of wing shape, body segmentation, and other characteristics—to help users navigate to the correct genus or species of the wasp of interest, along with available biological, geographic, and other information about the insect, including locations of existing specimens. In the Afrotropical region, the superfamily Cynipoidea is represented by 306 described species and 54 genera, but there are hundreds more species yet to be described, adds Buffington, who coauthored a paper describing the monograph in the April 2015 issue of the journal ZooKeys. 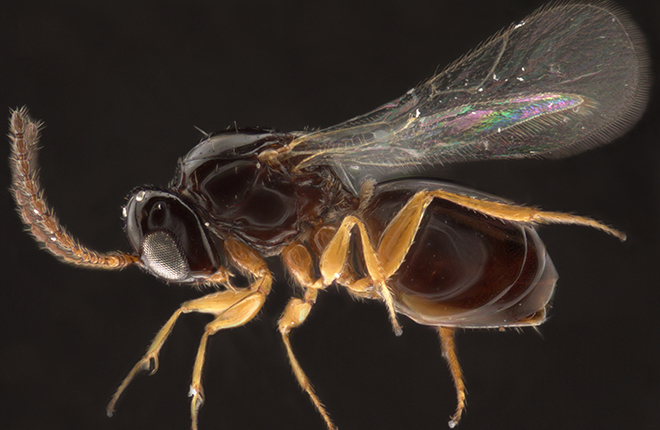 The resource, which brings together all that’s currently known about the Afrotropical members of this wasp superfamily “under one roof,” will make it easier to identify and categorize new species as they’re discovered. It will also broaden scientific understanding of their taxonomic associations and biological diversity. One important use could be the identification of wasp species having potential as biological control agents, such as those that parasitize crop-damaging flies or that form galls in the tissues of invasive weeds in the United States. Historically, the identification of cynipoid wasps has been rather piecemeal. Some specimens that were collected were not cross-checked with existing repositories of the wasps, or closely related species went ignored entirely, leading to a spotty taxonomic effort. So, Buffington and colleagues decided to pool their resources and expertise in conducting an exhaustive search and reexamination of specimens obtained from field sites and museum collections around the world. “There are few regional keys to identification in the world that are useful, and we generated the first such key for the Afrotropical Region, with long-term plans to have keys such as these made available to other parts of the world over the next 10 years,” said Buffington, who collaborated with Simon van Noort of the Natural History Department at the Iziko South African Museum and Mattias Forshage, with the Swedish Museum of Natural History. The final product resulting from this long-term initiative will provide an unparalleled comprehensive identification resource to a diverse array of economically and agriculturally significant wasp, bee, and ant species in the Afrotropical region and elsewhere, adds van Noort. —By Jan Suszkiw, Agricultural Research Service Information Staff. “Identifying Tiny Wasps” was published in the August 2015 issue of AgResearch Magazine. A new key-based system for identifying parasitic wasps has been developed. The system should help identify wasps with potential as biocontrol agents. 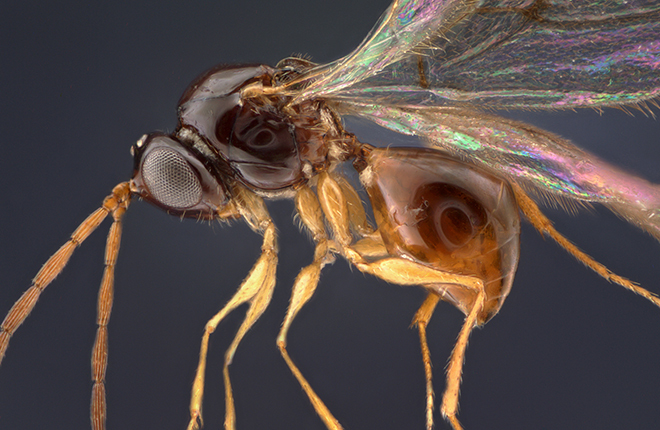 It standardizes description of Cynipoidea wasps in the Afrotropical Region. The system offers latest available information on 306 species and 54 genera.